Ray Vargo here. When I heard I would be on this blog today, I decided to introduce my friend, Jordan McAllister, to y’all. I first met Jordan when she hobbled into the Empire apartments one hot summer day, broken and battered with only four suitcases and her goldfish Maggie. Seems she put her own dreams on hold while she followed her fiancé around Texas while he scored jobs in sports reporting—her dream job, by the way. And where did that get her? Right here in Ranchero Texas writing the personals for the local newspaper. After lover boy started his latest job in Dallas and quickly fell in lust with the big busted weather girl, Jordan wanted as far away from big D as she could get. Unfortunately, they weren’t lining up to sign on a female sports reporter in a city full of good old boys and cowboys driving pickups. Anyway, back to my story. The gang at the apartment quickly took this dejected redhead under our wings, and God help anybody who messed with her. As luck would have it, the culinary reporter at the newspaper had a watercraft accident and ended up in rehab for six weeks. Given her journalism credentials, the editor temporarily offered Jordan the job with her own byline. But the man had no idea Jordan couldn't cook herself out of a macaroni and cheese box or that her idea of gourmet food came with fries. Once again the gang came to her rescue and came up with a plan. Twice a week she posts casserole recipes from me and my friend after the crew dubs it with the made-up fancy name. The good people of Ranchero quickly fell in love with both Jordan and her recipes (who knew gourmet food could be so tasty?) and when the previous culinary reporter ran off to Vegas with her smoking hot physical therapist and a huge settlement from the watercraft company, the job became Jordan's to keep. But even the new job doesn't keep our Jordan out of trouble. She's adopted my lady friend and me as her parents away from home, and trust me when I tell you, there is nothing we wouldn't do for her. That goes for everyone else in the apartments, too. For example, when she went on assignment to the cattleman's ball with the rich ranch owner (BEEF STOLEN-OFF) and her set-up date ended up DOA in a Fort Worth ER, she took us all on the ride while she landed in one jam after another. I can't wait to see what she gets us into on the cruise ship in MURDER FOR THE HALIBUT. I heard she was judging a cooking competition. Oh Lord! Whose hair brained idea was that, anyway? Here we go again. Now that you've met Ray and have been introduced to Jordan, I'd better tell you who I am. 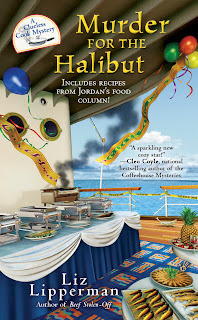 I'm Liz Lipperman and I write the Clueless Cook Mysteries for Berkley and A Dead Sister Talking mystery series for Midnight Ink. I'm so excited to join this wonderful slate of cozy authors and to introduce you to more of my characters in the coming months. I'm curious, though, do any of you guys have a person in your life like Ray who looks after you no matter how much trouble you get into? Let me know or just drop in to say hey. I wish I had Ray in my life! What would it take for him to move to Virginia? Could be that he just has a soft spot in his heart for Jordan. She's pretty special, too. Hey, Liz... welcome to a great group of 'characters'... in every way!! Look forward to reading your books. What a great gang of characters! Beef cook-off and a cruise...can't wait to get into them. Krista, everyone should have a Ray in their lives. He's a tough dude who is putty in the hands of his "girlfriend", Lola, a seventyish psychic who wears caftans from WalMart. As for Virginia--doubtful. that would mean he'd have to leave his friends and Jordan. Thanks for the welcome, Victoria. I think my characters will love all the other "characters." Waving at Erika. It was nice meeting you at Malice. And I can't wait to hear what you think about the cruise and the cooking competition. I need a Ray in my life, but I'm glad he's there to help Jordan, who trouble seems to find. Hey Dru, it's nice to see you here. I almost used Rosie again.